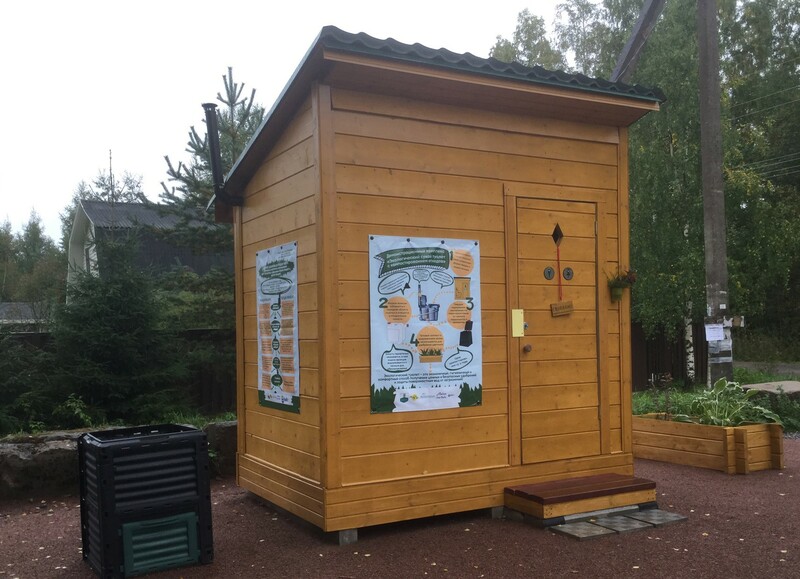 On 9th September 2017, the first ecological dry toilet with composting was created in the gardening community Fauna, situated in the Lomonosov district of the Leningrad region along the Black River basin. This forms part of Ecocentrum’s project on reducing nutrient loads in the Baltic Sea region through the adaptation of small-scale solutions. The installation and presentation of the demonstration toilet was supported by the Fauna gardening community, Ecocentrum Ltd., the Baltic Sea Conservation Foundation, and the Nature and People’s Program as part of Coalition Clean Baltic and the Friends of the Baltic NGO. Dry toilets are considered one of the most ecological methods of wastewater treatment (WWT) for individual households, since waste is directly transformed into organic fertilizers, which serve as a valuable resource whilst further protecting the environment. The HELCOM Baltic Sea Action Plan adopted by all coastal Baltic countries and the EU, including Russia, aims at restoring good ecological status of the Baltic marine environment by 2021. The agreement highlights the urgent need to equip settlements and households with improved wastewater treatment facilities, but fails to include dacha (“seasonal Russian second-homes”) and gardening communities. There are 3.5 thousand gardening communities and over 2 million gardeners located in the Leningrad region. Over the three summer months, these communities produce more than 2,300 tonnes of nitrogen, 300 tonnes of phosphorus and over 700 tonnes of potassium, which ultimately flow into the Baltic Sea. Therefore, there exists an urgent need to introduce proper wastewater management systems in this area. The demonstration complex launched as a pilot study in the gardening c ommunity Fauna will serve as an example to encourage gardeners and communities to develop and use dry toilets and disseminate their experiences. Fauna serves as an excellent location for this purpose, being situated at the community board centre where gardeners come together twice weekly to solve issues with the local chairman. Visitor numbers rise to over 1,000 annually, creating a great base for spreading awareness and learning about this new methodology. The demonstration complex consists of a toilet, a garden composter and a flower garden, which will be fertilized with the help of toilet waste. The toilet has a typical design, consisting of a toilet bowl and a tank made of a solid, chemically resistant polymer material. The solid component (faeces) enters a special storage tank and is transferred to the compost once it reaches its limit. The liquid component (urine) is diverted into a separate storage tank via a tube. After each use, the toilet is sprinkled with a peat mixture from the tank using a rod-like structure similar to those used in urban toilets. Compost is aged for 2-3 years and is then used to fertilize and improve the structure of the soil. Urine is preserved in the sealed container for approximately 6 months, after which it becomes pure and can be used as an alternative fertilizer. The launching ceremony of Fauna’s demonstrating complex was a huge success, attracting not only gardeners, but also representatives of public environmental organisations that contribute to improving the environmental status and sustainable development of rural areas. Information stands helped visitors gain knowledge on different types of dry toilets, dealing with and reducing plastic waste, along with determining the content of nitrates in wells and water reservoirs. The exhibition, “Ecological dry toilets”, showcasing banners on the demonstration complex, the advantages of dry toilets and composting rules further helped disseminate awareness to guests. As a result, a large number of gardeners have decided to initiate similar studies on their sites and neighbouring water bodies. 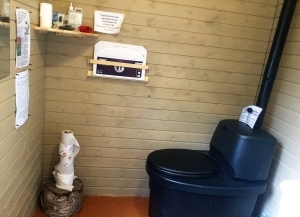 Organisations such as Biodynamics, a company engaged in the development of organic farming in the Luga district of the Lenningrad region, also showed great interest in adapting to the usage of ecological dry toilets.